This adventure stands alone or follows The Temple of Kubla Khan! For long years the Temple of Kubla Khan stood, a lonely edifice in the waste. Here the Khan's priests had paid homage to the demi-god of war. But in time of years their numbers dwindled and eventually the Temple fell into ruin. It stood unoccupied for ages until Yuggily, the Crawling Queen, came to reside there, making the Temple a nightmarish prison. Unknown to the Queen, her prison's foundations were a Tomb's ceiling. Over all these long years the Tomb of Kubla Khan, long ago sealed to prying eyes, lay forgotten, hidden beneath the Temple's Floors. But in time, a band of doughty adventurers managed to win their way into the Prison of Yuggily. Through horrific struggles they came to her den and cast her and her foul minions to the abyss. Unbeknownst to them, they unearthed the hidden portals that led to the entrance of the tombs themselves, far below the surface. A horror lies within the Khan's Tomb. Few who have enterd have returned and those who have, gibber madness of dark places and strange, nightmarish creatures. They speak of insects the size of men who bare weapons and shields of iron. They babble of the priest of the dead and the war between the insects and his beasts of madness. But there are rumours too, rumours of a wealth beyond imagining. The old Khan hoarded mounds of gold and gems, artifacts and relics of power to hurry his passsage to the divinity he ever sought in life and strove to achieve after his death. It is this hint of wealth that calls the intrepid adventurer to the Tomb of Kubla Khan. 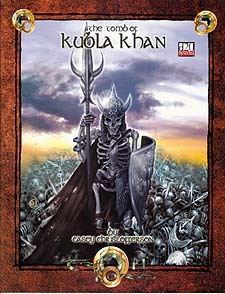 The Tomb of Kubla Khan is an adventure module designed for 4-6 characters of 7-9th level.